Written on January 4, 2007, and categorized as Secret and Invisible. Well, here it is, 2007, a little bit late, but nonetheless served up freshly cooked with lashings of hot tea and only the mildest hangover from 2006. 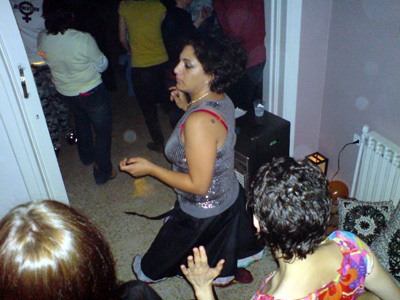 I began the year by attending the most hilarious party hosted by far out gays and lesbians in Amman. We jigged and bopped and frisked and stuck our hands in the air, and everyone necked a huge amount of whatever it was they were necking. A small-ish domestic hi-fi on full volume was plenty enough to keep thirty people dancing until 3 or 4am, at which point we headed to the airport, passed out on a plane, and woke up back in Blighty. We decamped from chaotic Heathrow, staggered back to base, waded through two weeks of unopened mail, unpacked, slept, ate, slept. Blighty is cold, and the sun is blue. My first desire in 2007 is to move to Italy. I worked quite hard over the holiday period, even managing an interview for the BBC on Christmas day. I’m going to work on the connections I made in Palestine and Jordan, and I’ll see what grows from the small seeds I was able to plant there, in the snow. And snow it did – although the middle-eastern sun was warm, we still experienced the first rain for over a month, followed by proper snowfall. So, the romance of the trip was all the way up to eleven; and by the time I had recovered from my fever, I was even able to enjoy Jerusalem, although it was rather like visiting a prison, in which the prisoners elect to remain locked inside. Meanwhile, back to blogging business. 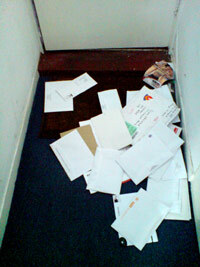 I’ve lost my 390+ photo moblog – curses to TextAmerica, with their appalling customer service! and so moved over to Flickr, like everyone else, where I’ve started all over again. I’m about to transfer my Blogger account (finally!) over to the Brand New Googlified Blogger. Presuming that Blog of Funk survives the transfer, I’ll most probably spend some time over the next couple of weeks tweaking the livery, combing through my two and a half year’s work, and maybe I’ll even publish a Best Of. Did you get back to the UK fast enough to go to another New Year’s Party? All the best for ‘007! My change to the new Blogger went quite smoothly. I have a photojournalist friend who had to convince Blogger to change him over (I’m not sure why…maybe too many high-res pics?). So, if you have trouble changing over, I guess you can do some Google-fied arm twisting.